Researchers studying the life and works of Russia's great marine painter Ivan Aivazovsky are fortunate to have at their disposal a wide array of material. This ranges from photographs of the artist and his family, to rare documents such as the letters patent accorded by Alexander I which granted to Aivazovsky and his descendants the title of nobleman and a family coat of arms, and the texts of speeches celebrating the artist's work that were made at events in his honour. A special place in this collection is occupied by a tea service of exquisite porcelain decorated with seascapes by the outstanding painter. It was created by the St. Petersburg Imperial Porcelain Factory, the output of which was almost exclusively for royal use. So considerable were the Imperial family's needs that private commissions and the manufacture of items for general sale were extremely rare. The Emperor himself closely followed the activities of the factory's management and the work of the top masters: when commissioning new pieces, he would often take part in discussions on their style, evaluating preliminary studies and offering suggestions on examples to be emulated. Particular attention was always paid to the so-called “items for presentation”. The “presentation” was a yearly exhibition that took place just before Christmas, usually on December 22-24. Under Alexander II, in accordance with a long-running tradition, it was held in St. Petersburg's Winter Palace. Prior to the event, a special order from the Ministry of the Imperial Court stated that “Items... for the presentation should be arranged in the Concert Hall.” The management of the Imperial Porcelain Factory would make sure that these items for presentation were among its finest work. 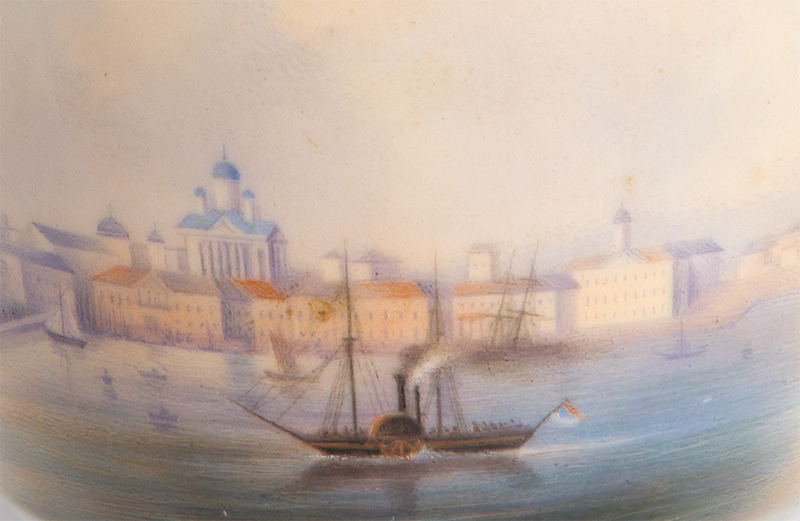 Together with other public china works, Russia's leading porcelain factory demonstrated “To Their Imperial Majesties examples of their work, showing the current state and successes of the factory.” Shortly before the event, a list of items was compiled, showing the names of the intended recipients. The Emperor would take an active role in selecting and commissioning this or that item for each particular member of the Imperial family. In 1861, Alexander II ordered a special Christmas gift for his younger brother, General Admiral Grand Duke Konstantin Nikolayevich. 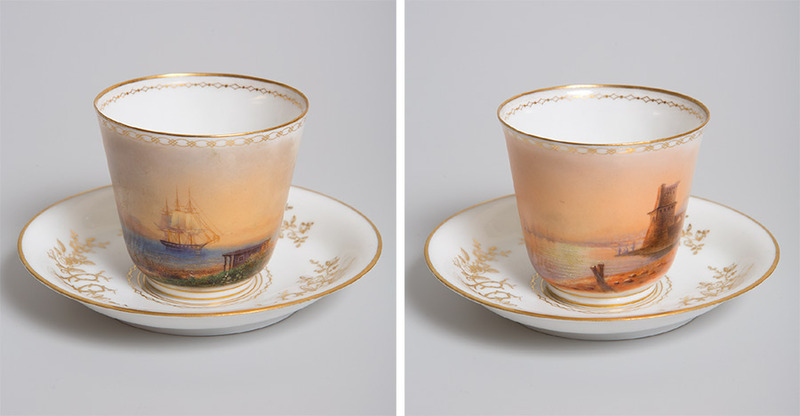 The list of “items for presentation in honour of the Nativity” officially described the porcelain service for a dozen people as a “tea set of 18 items, decorated with images of Aivazovsky's seascapes”. As well as this description, the list stated the intended recipient of the gift, Grand Duke Konstantin Nikolayevich. 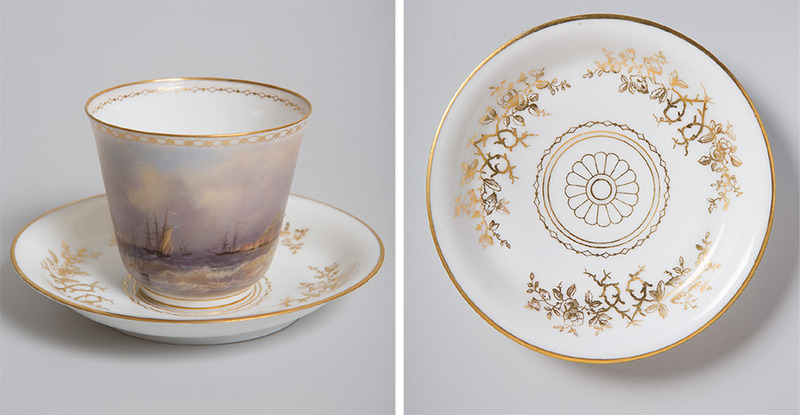 A total of 11 tea cups, 10 saucers, a teapot, sugar bowl, milk jug and slop bowl from the service can be seen today in the Peterhof Museum-Reserve; all items apart from the saucers are decorated with miniature copies of seascapes by Ivan Aivazovsky. The decoration of this unique gift was no random choice: Alexander II realized that his brother would treasure the tea service. “Even in the Grand Duke's early childhood, his father, Emperor Nicholas Pavlovich, intended Konstantin Nikolayevich one day to head Russia's military fleet and naval establishment. At the age of just three, the Grand Duke was made... General Admiral and commander of a company of the Guards.” At 19, Konstantin Nikolayevich was made Captain of the First Rank; in 1848 he was appointed Counter (Rear) Admiral; and in 1853, upon gaining the rank of Admiral, he took charge of Russia's Naval Ministry. The Grand Duke was a great admirer of Aivazovsky's work and served as his patron. He was still a child when he first met the famous artist in 1836, on a naval training voyage in the Gulf of Finland and the Baltic Sea. 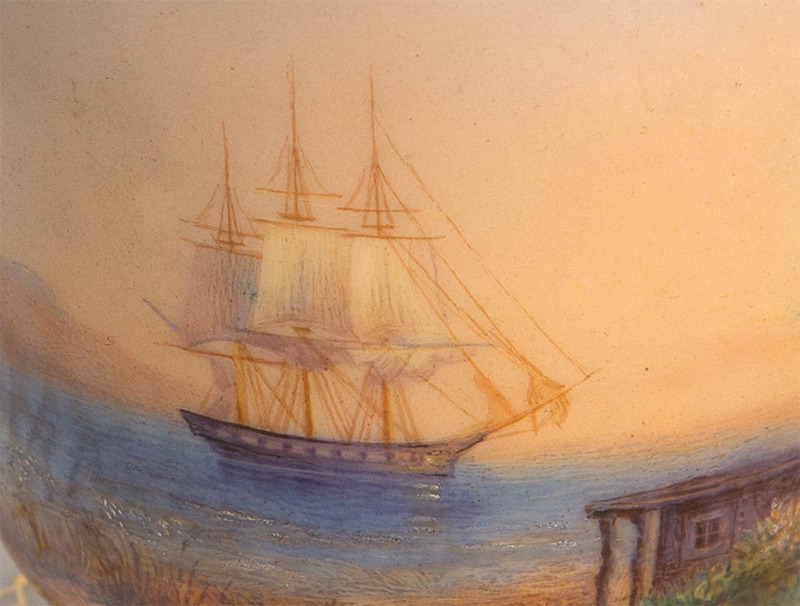 Later, in 1845, the painter was chosen to join the group that accompanied the young Grand Duke on his voyage to the Sea of Marmara, the Aegean and the Black Sea. An avid collector of Aivazovsky's sketches and watercolours, the young Konstantin Nikolayevich would paste them lovingly into his magnificent albums, adding thorough, detailed notes about them. The tea service was made using moulds developed at the Imperial Porcelain Factory in the late 1850s. The factory artists produced miniature copies of Aivazovsky's famous seascapes with extraordinary skill. Reproducing the details of the originals with maximum precision, they positioned the images expertly on the curved surfaces, ensuring that the sense of perspective and the original colour schemes remained. 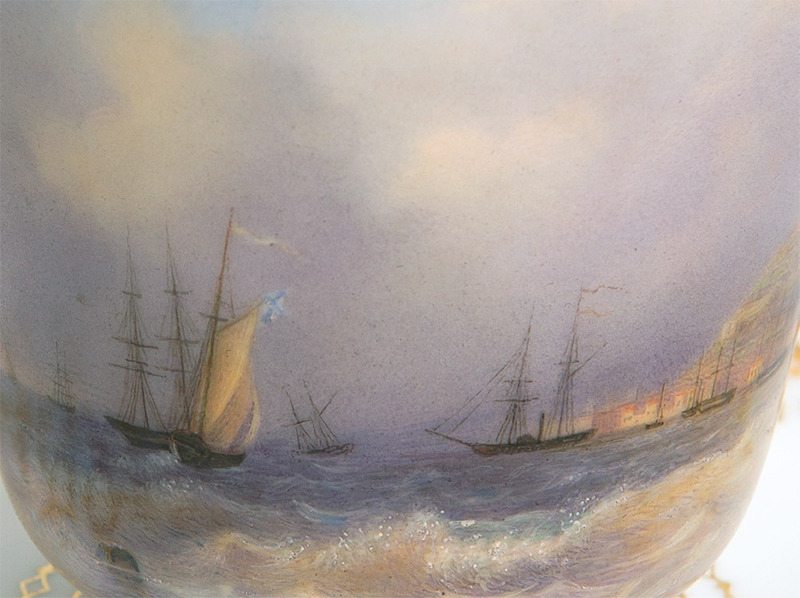 Occasionally, minor changes were deemed necessary in view of the small size of the porcelain objects; in some cases, the items were decorated with a fragment of a painting, rather than with the entire image. 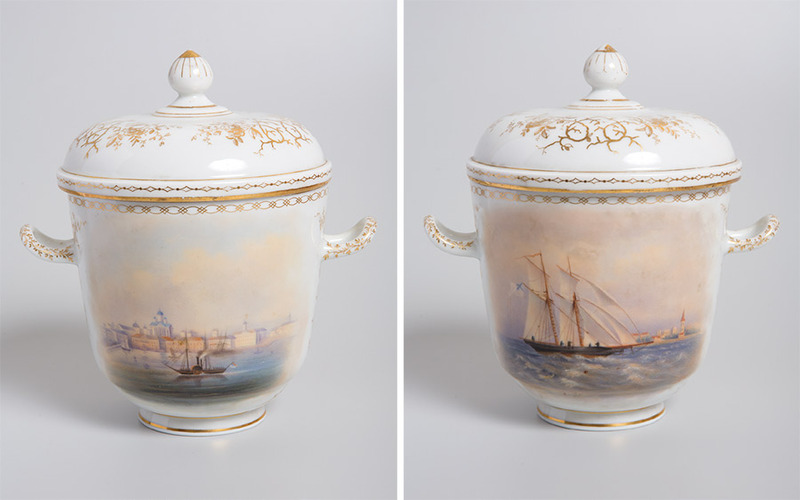 The miniature images adorning the tea service were taken from well-known works by the famous marine painter, such as “Frigate under Sail” (1838, Central Naval Museum, St. Petersburg), “Russian Squadron on the Roadstead of Sevastopol” (1846, Russian Museum), “Old Feodosia” (1845, National Gallery of Armenia) and “Pier in Feodosia” (1846, Aivazovsky Picture Gallery, Feodosia). In some cases, it has not been possible to establish the current location of Aivazovsky's original paintings, such are the two works “Sevastopol. Grafskaya Quay and Nikolayevskaya Battery” and “View of Smolny Convent from the River Neva in St. Petersburg”. Russian State Historical Archive, collection 468, inventory 10, file 239. Russian State Historical Archive, St. Petersburg. Collection 503, inventory 2, file 21, folio 107. 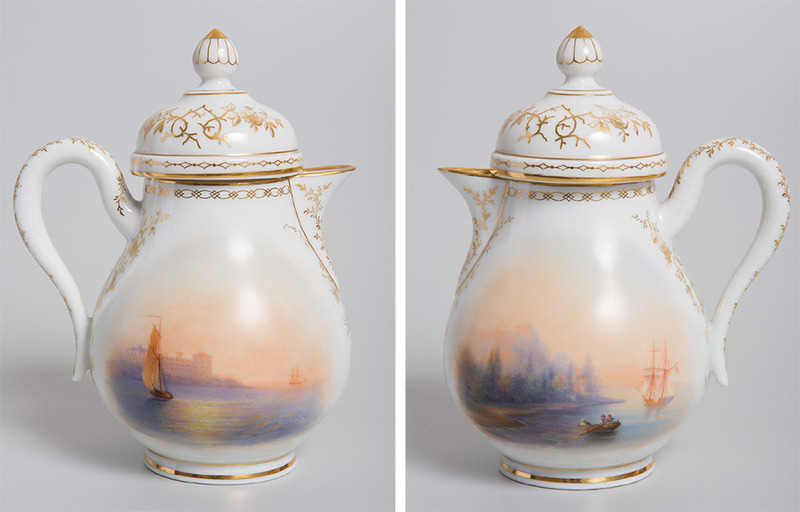 Kudryavtseva, TV “Russian Imperial Porcelain”. St. Petersburg, 2003. P. 175. The fifth child and second son of Emperor Nicholas I and Alexandra Fyodorovna. 9 September 1827-13 January 1892. Grand Duke Konstantin Nikolayevich was the paternal great-great grandfather of Charles, Prince of Wales, heir to the British throne: Konstantin’s daughter Olga married George I of Greece, whose son Andrea married Alice Battenberg, that marriage producing Philip, Duke of Edinburgh (Philip Mountbatten, born Prince Philip of Greece and Denmark), the father of Prince Charles. “Russian Biographical Dictionary”. Knappe-Kuchelbecker. St. Petersburg, 1903. P. 120. The author expresses her gratitude to O.E. Kayander for assistance in identifying these works of art.